I am sure you ladies got the email this week about Nordstrom's triple points promo. I tried to ignore it, file it away to the back of my mind and not look, but how could I not? It's TRIPLE POINTS time. What does that mean? For every dollar you spend using your Nordstrom credit/debit card you will earn 3X the amount of points than you normally would. If we are going to shop, and we all know we will, we might as well do it now and earn the extra savings for later. On Wednesday I mentioned five of my favorite wardrobe essentials for the fall and winter seasons. I thought I would remind y'all one more time and throw a few more into the mix. I love a good floppy hat like this one for less than $30. They add a fun element to so many styles and looks. Plus, when it's raining or that pesky cowlick won't go down they become a lifesaver...and did I mention their fun? I have a brown one that I purchased last year and picked up a new black one that I will show you next week. Cardigans. Another lifesaver on days when all that matters is staying warm, comfy and cozy. I am loving all the over sized, chunky knit options that are available this season. And because owning too much plaid isn't possible, I want this one in both colors. Speaking of plaid...I am always drawn to the "classic" plaid like this one, but I am REALLY wanting all three of these fall color combos too...maybe because they are only $20. I saved the best chat for last, shearling! Oh my goodness, this takes me back to the days of bomber jackets. Top Gun anyone? I am so happy that it's come back around. I just wish I didn't get rid of mine so many moons ago. I love the contrast sleeves on this one. It not only looks super cozy, but chic too. I couldn't believe the price on this camo option. I really want it for our weekends at the ranch. Oh, one more quick note, the cut out heels I featured today are almost the EXACT pair I got from Zara last year. I wore them in my post on Wednesday. I got a few comments asking about where they were from on Facebook and Instagram, so I wanted to share the link again. The sizes are running low and they are on MAJOR sale...50% off major. If you want them and they still have your size, I would act fast. Your chance to earn Nordstrom triple points ends this Sunday. Don't miss out. Happy shopping and weekend. We don't have a nordstrom here! KY is like the backwoods of fashion. It's where people still wore overalls last year and suddenly overalls were back...but they still weren't wearing fashionable clothes! I think I'll just order accessories online from Nordstrom. Accessories always fit! I am loving all these fall hats I see, I especially like the one you posted. Great fall wear! Those credit card point promos get me every time! And thanks for sharing a link to those heels. I had noticed them on the instagram post and they are fantastic! Love Nordstrom! 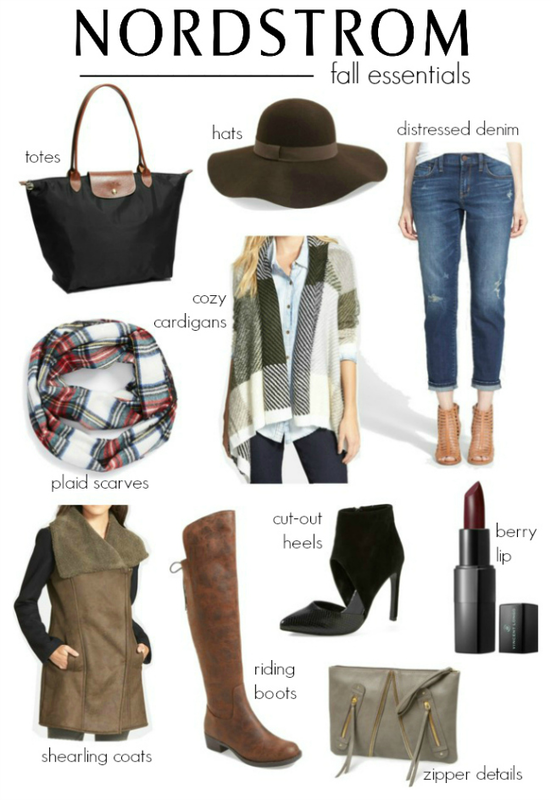 I actually ordered that plaid scarf the other day :) So glad I did since every blogger is talking about it. lol! I am sure it will sell out! I actually didn't know... and I think I need that scarf!! Love the hat and scarf!! I'm not the hugest infinity scarf fan, but I seriously love that one with the orange and blue. I might need to consider that. I need a floppy hat! and apparently a Nordstrom debit card, to earn me some points! Oh no super tempting! And you just curated everything I need for fall! Love that cardi and it's a good price! Great roundup! I don't know why I'm not getting the emails from Nordstrom but YAY for 3x the points!! I'm loving all these pieces! LOVE the cardigan and cut-out heels! A pair of grey ankle boots and a brown felt hat are on my Fall wishlist!! Great picks Shanna! Hope you are having a wonderful day!